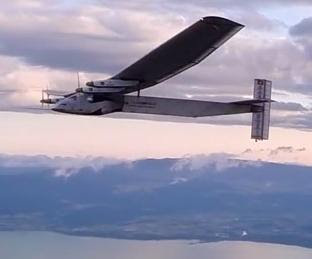 The experimental solar-powered aircraft SI2, piloted by Swiss explorer Bertrand Piccard and working on circumnavigating the planet, landed yesterday in California after 62:29 hours flight across the Pacific. Piccard and his partner Borschberg have completed the ninth leg of the round-the-world trip. The elegant solar aircraft has the wingspan of a Boeing 747 but only weighs about as much as an SUV and travels at about the same speed as a car. Read more at http://www.cnn.com and watch the video.